I'M THINKING OF YOU [installation version] - performance at Royal College of Art, London. Part of Gender and Performance Symposium. 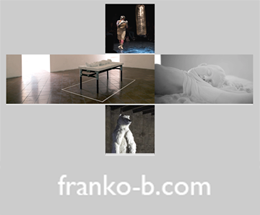 Franko B’s installation begins from 2pm. I'M THINKING OF YOU - performance at Chelsea theatre, London, November 2009.
music composed and performed by Helen Ottaway.